Two Irish League match officials were treated in hospital for injuries after being involved in a “serious traffic incident” while travelling to a game. 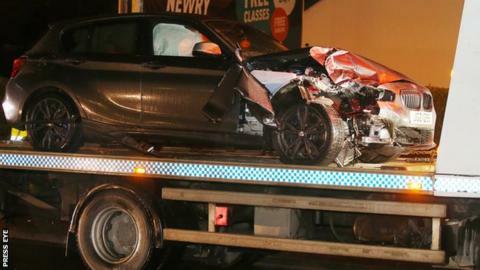 Friday’s fixture between Newry City and Glentoran was postponed after the crash on the Warrenpoint Road in Newry. The four officials scheduled to take part in the match were travelling in one of the two cars involved. The Northern Ireland Football League confirmed the officials’ involvement in the collision on Friday evening. The match was due to take place at the Newry Showgrounds at 19:45 GMT and NIFL confirmed the postponement just before 19:00 GMT, saying it was due to a “serious traffic incident involving the match officials”. “The match has been called off and will be rearranged and announced in due course,” a NIFL spokesperson said. “Our thoughts are with the four match officials travelling to the match tonight and we would wish them a speedy recovery. Both Glentoran and Newry City sent their best wishes to the match officials involved. “We extend our best wishes and hope they will be fit and able to celebrate a happy Christmas at home with their families,” the Glentoran statement added.